If you haven't seen this yet then go and watch it! The film is set in New York in the 1920's . 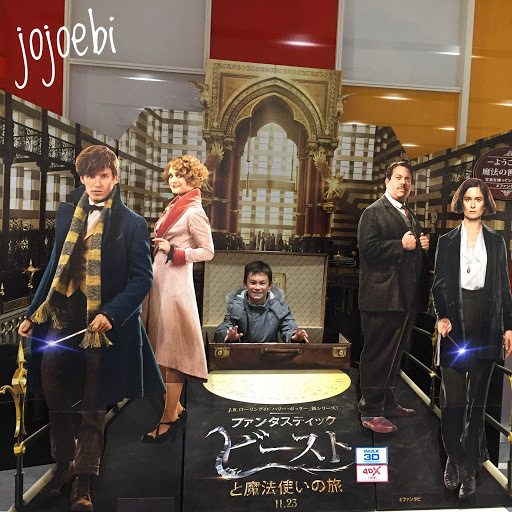 Newt Scamander (the main character) is a Brit visiting New York and some of his magically beasts escape his suitcase. The story isn't really about the book of the same name but the book does get a mention. There is also the muggles vs wizards and good vs evil twisted into the storyline and of course no mention of Harry Potter but Hogwarts and Dumbledore are brought up in conversation as with a few more names which is really setting everything up for the next film. Which, I can't wait to see! I don't want to share too much but do look out for the surprise appearance at the end, I had NO idea and nearly chocked on my popcorn! Is it suitable for little kids? I think it very much depends on the child. We watched it in 3D, which makes it more exciting and more scary. Like the HP films there is far more to be read into the story than what is shown on the surface. It is quite violent in places and I can imagine the black magical force could upset some kids. Ebi-Kun wouldn't have enjoyed this film when he was 5 or 6. And I doubt kids that age really grasp the main story. I'm sure 4D would have been brilliant but they were only showing it in Japanese - boo! We can't wait for the next one and Ebi-kun is pestering to see this one in 4D, it would be fun!